The bins! The bins I'm using to store my fat quarters came from Staples. Here's the product label. The bins are 23" x 15" by 6" tall. A very nice size, they hold a lot but not so much that they are heavy or bulky to tote around. They are also made to stack, I don't stack mine, they are just sitting on shelves in my closet, but if you needed to stack them you could. I also really like the height, just the right size for how I fold my fabric. There's a little bit of space under the lid, but not much, no space wasted there. Added later: Staples no longer carries these bins, but they are still around, look for them online or at Target or K-Mart. So Monday I played with fabric and yesterday I worked so I don't have much to report from my sewing room. Have I ever mentioned that I have a job? I'm a teacher, a substitute teach, a daycare substitute teacher, a DOGGY daycare substitute teacher! My dog Cooper goes to doggy daycare and every now and then they need a little help in the daycare room and I'm happy to do it. 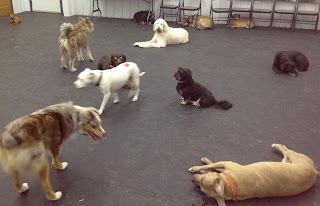 I tried to get a picture of all the dogs at daycare but this is as close as I got. See these 11 dogs, there are 10 more surrounding me as I took this picture. The labs and goldens are always under my hands, waiting to be petted, there are also two schnauzers that never stay still and are impossible to catch with my slow camera phone. I'm either filling up the water bowl, throwing a ball or walking. I can't stand in one place too long otherwise I'm surrounded by dogs, and really, you don't want 21 dogs in a small space, not moving. And sitting, forget about that. You would think having 21 different dogs under one roof would equal nothing but fights and fur flying, but the dogs are interviewed and only the ones with good social skills are accepted. It's a fun day for me, Cooper's not so sure he likes having his person petting all his friends, but he's getting better every time I go. So while I don't have a Carolina update I do have a quilting update, I got three quilts back from the longarm quilter on Monday. These were done by Connie Lancaster at Quilts Plus in Indianapolis. Connie quilted my Red and White Tribute Quilt and always does a great job for me. First up, Lifetime Quilt Number 90, Date Night. 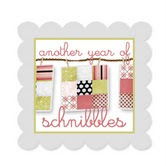 Here's what I love about Sherri and Sinta's Schnibbles sew along. I probably would have passed on this fabric, Little Black Dress by basicgrey. But I had just enough charm squares to make the June Schnibbles pattern Leap Year, now I have a very pretty quilt that is dressy enough to hang out in the living room. Connie went with an all over design with this fancy work in the border. I like how it looks on the red couch. My Red and White Tribute Quilt is on the other red couch, and while it didn't just come home from the quilter, this is the first time I've had the nerve to put it out and use it. This is like 4 quilts in one, depending on how I fold it! And finally, Lifetime Quilt Number 93, Northern Lights. 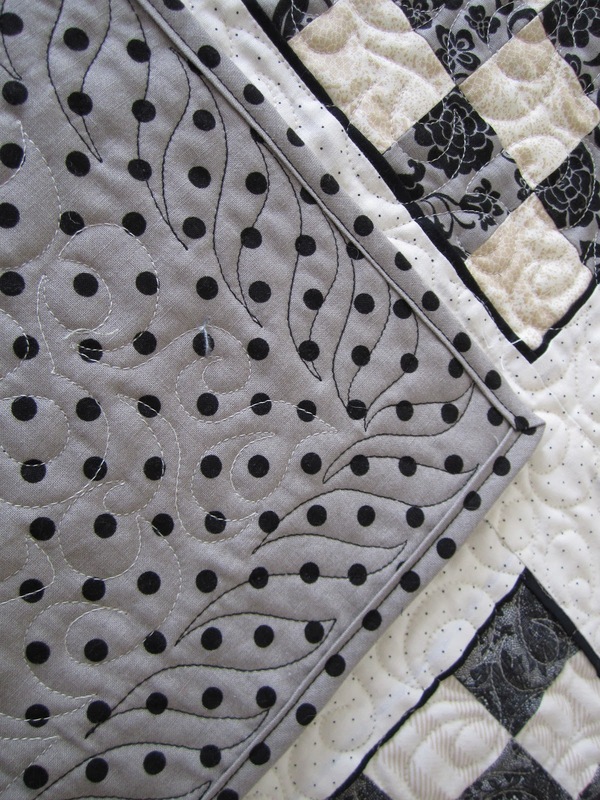 When's the best time to have a neutral quilt out? This replaced Madeline's Good Fortune which has been on the bed since February. A la Mode will be making its summer appearance come mid May, so I guess this is as good a time as any to have a neutral quilt on the bed. My husband noticed right off that there was a new quilt on the bed. He said, "hey I like the new quilt, it doesn't have any color in it, it doesn't have any RED". My poor husband, I do have a lot of red in this house. 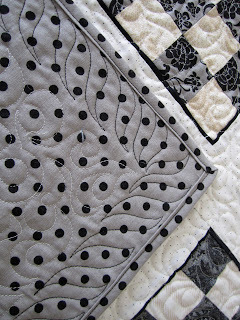 Here's a close up of the quilting on this top. It feels great to have some new quilts out, I was ready for a change of pace. If you have any questions about any of these quilts look for the quilt on my Lifetime Quilt Tab. 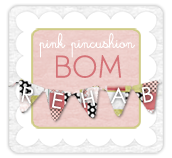 Besides spending some serious time in my sewing room today, I intend to get caught up on my email, if you've been waiting to hear from me, you will today!